Every element of this stunning ring reflects Neil Lane's iconic extravagance and handcrafted couture. Set in 14ct white gold, sparkling diamond set shoulders lead to an indulgent double halo and round solitaire centrepiece. Finished with elaborate engravings and elegant milgrain detailing. This engagement ring has a matching wedding band under code 1351702. 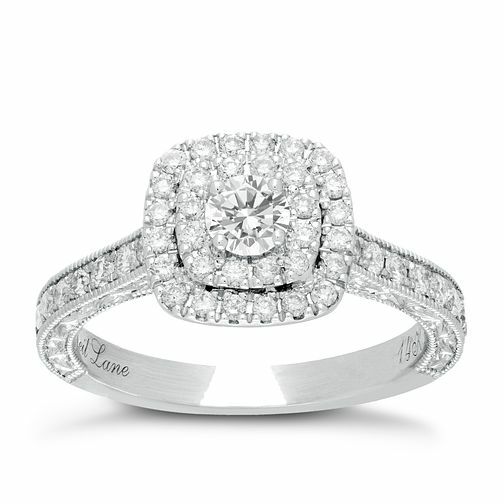 Neil Lane 14ct white gold 0.87ct diamond halo ring is rated 5.0 out of 5 by 10. Rated 5 out of 5 by Anonymous from Excellent all-round This is something truly special, the ring itself doesn't disappoint in area. Somehow the ring manages to encompass both elegant sophistication and also boasts a brilliant beauty, this rare duality causes draws eyes from every corner of room. This is always followed by a gleeful duality of it's own, a joyful and impressed envy, lead by compliments and gasps of excitement. Rated 5 out of 5 by Anonymous from Stunning. This ring is absolutely beautiful. The online pictures really do not do it justice. Please please please go into Ernest Jones to look yourself if you are unsure because it really is amazing. The detail around the sides of the ring adds such a special elegance. Sooooooo in love! Could not recommend enough! All I can say is my boy did good! Very very good.